The successor of nForce 570i SLI is faster, the ASUS board is sometimes faster with CR2T compared to the MSI P6N-SLI Platinum with CL4-4-4-12-CR1T settings, especially with very high CPU-clocks. CR1T was not possible with higher clocks then 800MHz, some benchmarks will crash. The same downside comes to the chipset-cooling compared to the P6N-SLI. Temperatures do easily exceed 60°C especially during overclocking, but ASUS doesn't provide any additional fans, to cool it down. ASUS has choosen an AMI BIOS, which looks still beta. The CPU multi won't work on our CPU, it shows correct frequency on boot up, but does boot with full multi. So we could not test FSB 400 or more. The overclocking settings are in different menues, standard for ASUS, but user-unfriendly. The rest is fairly common nothing special. As mentioned above, without a lower multi, we where not able to check out how high the FSB can go. We tried the usual 373MHz, which worked fine, but the CPU was not stable to complete our benchmarks. 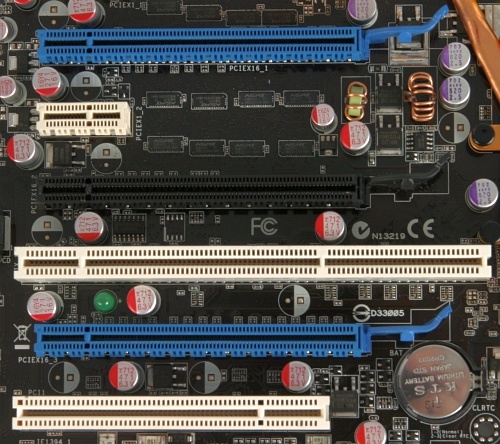 The same CPU was used with the MSI P6N-SLI Platinum where all benches worked. The board worked with 1000MHz but did not boot up with our rated 1200MHz kit. The CR1T setting is not possible with clocks above 800MHz, synthetic benches do work, but Gordian Knot/XVID is always crashing. Due the BIOS multi-bug we could only reach stable 3666MHz, but we doubt we would have reached more. The worst problem ist the VRM. "Eight-phases" sounds cool, but that's it. The VDrop was above Intel specifications of 5mV. While the MSI run the 3666MHz with a VCore of 1.5000V, ASUS needed 1.53750V. As you can see VCore drops to 1.472V. This is not exactly the voltage, because the sensor is only able to give 8mV granulars, even when you can set the VCore in 6.25mV steps.